Deliver some suspicious orders to the Hlaalu Vault clerk in Vivec. Speak to Odral Helvi to learn your next assignment. Travel to Vivec to deliver the orders. Tenisi Lladri (to help Odral). Baren Alen, Rovone Arvel, or Crassius Curio (to help the House). 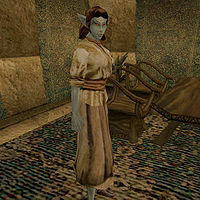 Odral Helvi in the Governor's Hall in Caldera will ask you to deliver an order to the Treasury Assistant Clerk, Tenisi Lladri in the Hlaalu Vaults in Vivec. He also says "do NOT deliver them to the head of treasury, Baren Alen". It sounds a little like the suspicious activity Crassius Curio warned you about. There are two ways to deal with this: do what Odral asks, or report this suspicious activity. Simply take the orders to their intended destination, which is simple enough. Just head to Vivec and the House Hlaalu Canton. The treasury is in the waistworks, and the Treasury Assistant Clerk can be found within. Tenisi will readily accept the orders and give you 100 gold and a +10 disposition increase once the delivery has been completed. Besides Tenisi, three people will accept the orders: Baren Alen, Rovone Arvel, and Crassius Curio. All three will give you a reward of 500 gold and a personal disposition increase; +10 for Baren, +15 for Crassius and +20 for Rovone. If you give the orders to Baren or Rovone, however, Odral Helvi finds out about it and is furious as a result, costing you a -30 disposition penalty with him. Crassius manages to hide everything from him, though, giving you the normal +15 disposition increase. If you open the orders and cannot reseal them, Tenisi's disposition towards you drops ten points when you hand them over instead of increasing. Your chance of successfully resealing them without the tampering being detected is equal to your Security skill - 1. In other words, even with maxed Security, you still have a 1 in 100 chance of damaging the seal. After you give the orders to Tenisi and report back to Odral, you can pickpocket them from her to give to the others to get their rewards. 5 Crassius Curio asked me to speak with Odral Helvi in Caldera. 10 Odral Helvi gave me sealed orders to deliver to the assistant treasury clerk, Tenisi Lladri, at the Hlaalu Vaults in Vivec. The vaults are part of the treasury, which is in the top level of the Hlaalu Waistworks on the north side. 50 I gave the orders to Tenisi Lladri in Vivec. 55 I gave the orders to Crassius Curio. 60 I gave the orders to the Treasurer Baren Alen. 65 I gave the orders to Rovone Arvel. 100 Finishes quest Odral Helvi thanked me for delivering the orders. 110 Finishes quest Odral Helvi was angry with me for not delivering the orders to Tenisi Lladri as he asked. This page was last modified on 15 February 2016, at 19:13.